Place fish on a sheet pan lined with parchment paper. Top with Pastrami Cure mixture and pack it on fish, top, bottom and sides. Let stand in refrigerator for up to 4 hours. Rinse fish under cold water and wrap in paper towels to dry. Let dry in refrigerator for 1 hour before using. 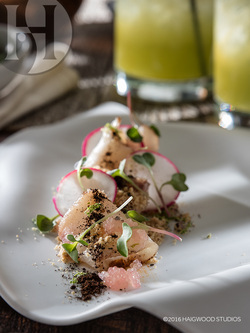 To plate, cut cured hamachi into 1-ounce slices. Serve 3 slices per person drizzled with 1 ounce Red Mole Sauce each. Scatter remaining garnishes, lightly drizzle plates with olive oil and serve. Toast spices in a small sauté pan until they release their fragrance. Grind toasted spices roughly using a spice or coffee grinder. Chop bay leaves. Combine all ingredients in a mixing bowl. Bloom chiles in hot water until they are soft and workable. Remove stems and seeds. Add lard to frying pan. Once hot, cook onion and garlic until brown. Remove onion and garlic from pan with slotted spoon and add peanuts until toasted. Remove peanuts from pan and add sesame seeds. Toast until golden brown. Add tomatillos and sauté. Add tomatoes and stew for 10 minutes.